Dinner all comes together easily with this delicious roasted chicken dish. Placing a lemon inside the cavity while roasting gives the bird a nice citrus flavor. So simple, this meal will soon be your go-to favorite. 1. Remove chicken from the fridge 30 minutes prior to cooking. 2. Preheat oven to 475°F. 3. Wash and roughly chop the vegetables. 4. Break the garlic bulb into cloves, leaving them unpeeled. middle of a large roasting pan and drizzle with olive oil. 7. Carefully prick the lemon all over, using the tip of a sharp knife (or microwave it for 40 seconds to bring out the flavor). 8. Put the lemon inside the chicken’s cavity, along with the herbs. 9. 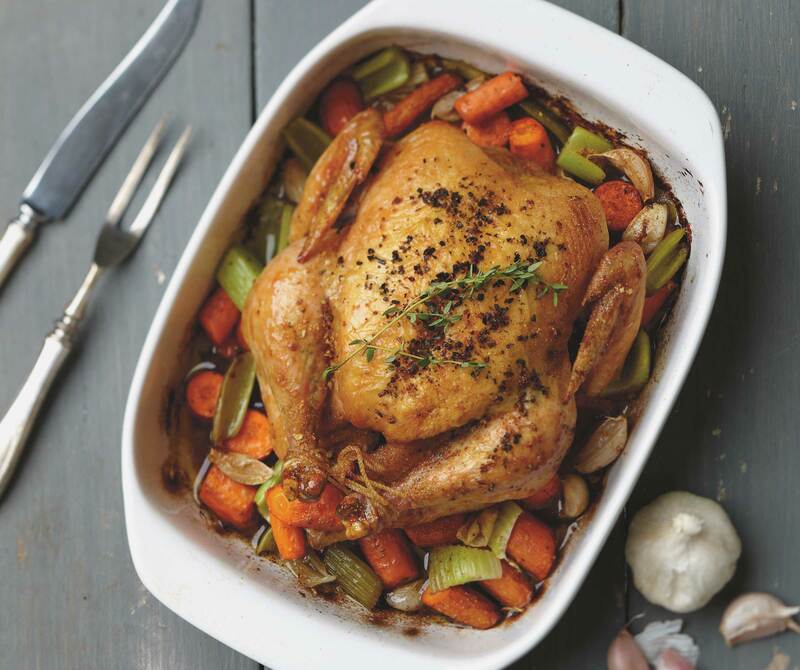 Place the chicken on top of the vegetables in the roasting pan and put it into the preheated oven. 10. Turn the heat down immediately to 400°F and cook the chicken for 1 hour and 20 minutes. 11. Baste the chicken halfway through cooking, and if the vegetables look dry, add a splash of water to the pan to keep them from burning. 12. When cooked, remove the chicken and vegetables from the oven and transfer the chicken to a board to rest for approximately 15 minutes. 13. Cover it with a layer of foil and a towel and put aside until ready to serve. Previous PostGuess Who’s Coming to Dinner — Everyone!